The Triple Crown is in the rear-view mirror, but several of the Kentucky Derby contenders from this spring will continue to make a major impact as they begin to face older horses this summer and fall. Kentucky Derby Betting: Field Set! We’re now just weeks away from the biggest and most exciting date on the horse racing calendar – the 2014 Kentucky Derby, to be run at Churchill Downs. With the big race drawing closer and closer, the latest Kentucky Derby betting news is shifting from who might qualify for the field to who’s clinched their spots. The annual Run for the Roses continues to draw closer, which means each stakes race gets more and more important in terms of stockpiling points for Churchill Downs positioning. Four months is an eternity in thoroughbred racing. For proof of that look at the rise of Cairo Prince, the current Kentucky Derby betting favorite for May’s 140th Run for the Roses at storied Churchill Downs. 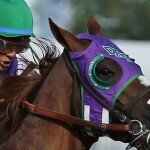 Kentucky Derby Betting: No Run for Indianapolis? There were a number of big developments on the Kentucky Derby horse racing odds front recently, as a several would-be contenders either solidified their chances at the Run for the Roses or saw those chances get considerably slimmer. Here’s a look at some of the horses making noise. Know when Kentucky Derby betting season is heating up? When horses start to clinch spots in the annual Run for the Roses. The pre-Derby circuit has been remarkably compelling over the last few weeks as the horses climb up the points leaderboard. Let’s take a look at some of the colts in the Kentucky Derby betting news as the annual Run for the Roses draws near. As we move closer and closer to the annual Run for the Roses, horses are steadily stockpiling points in the hopes of cracking the field for the 2014 Kentucky Derby, to be run at Churchill Downs. It’s been a busy time as the horse racing world keeps an eye on the field to bet on the Kentucky Derby. Races are being run, points have been grabbed and a number of ponies have already emerged as favorites for the annual Run for the Roses. Here’s a look at the latest headlines in the world of Kentucky Derby betting news, as the annual Run for the Roses draws closer and closer.